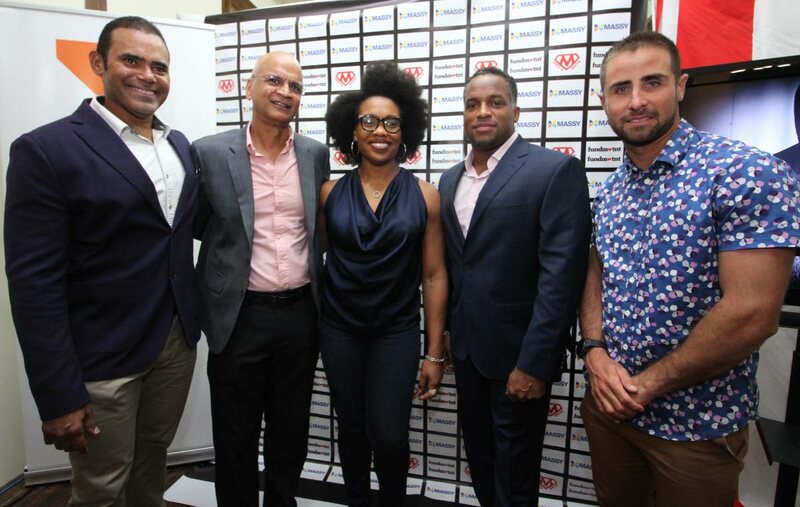 (Left to right) Michael Phillip of Phillip Promotions, director of Massy Foundation Earl Boodasingh, shot putter Cleopatra Borel, Olympic medallist Ato Boldon and Andrew Lewis take time out for a photo at the launch of the ‘Icons of TT’ motivational video, at Harts Mas Camp, woodbrook, on Tuesday. Boldon, former national cyclist Michael Phillips and his team at Phillips Promotions are among the people behind the video. The video features memorable moments in TT’s illustrious history in sport and culture, and did not only highlight past athletes and entertainers, but also people who are in the prime of their careers. Sporting heroes featured in the video, which is narrated by Boldon, include footballers Dwight Yorke and Russell Latapy, cricketers Brian Lara and Sunil Narine, cyclists Roger Gibbon and Phillips, sprinters Boldon, Richard Thompson and Michelle-Lee Ahye, swimmer George Bovell, shotputter Cleopatra Borel, sailor Andrew Lewis, paralympian Akeem Stewart and the 2006 World Cup football team. The video also highlights other cultural icons such as calysonians Lord Kitchener, the Mighty Sparrow, Calypso Rose, David Rudder, Black Stalin, soca artiste Machel Montano, masman Peter Minshall, designer Anya Ayoung-Chee, writer Sir Vidia Naipaul,panman Ken “Professor” Philmore and calypsonian Shadow, who both died recently. Beauty queens Wendy Fitzwilliam, Giselle Laronde-West and Penny Commissiong are also in the video. Boldon said, “As a society, we tend to discard our icons and our heroes. This is not about me, this is about the VS Naipauls and the Shadows. Bailey was a TT/British 100m sprinter, who represented Great Britain at the 1948 and 1952 Olympic Games. Boldon said for TT to produce top athletes consistently, current athletes must know about the past. He said the story of former TT weightlifter Rodney Wilkes should be told. Wilkes represented TT at the 1948 and 1952 Olympic Games. Boldon said in Jamaica the younger generation is more aware of past Jamaican greats, such as Olympic runners Don Quarrie and Herb McKenley. “We do not teach our kids our history, and that is unique to us, because the kids in Jamaica they know about Don Quarrie, they know about Herb McKenley. Among those featured in the motivational video, who attended the viewing included Fitzwilliam, Lewis and Borel. In the three-and-a-half-minute video, Boldon says the size of TT does not prevent this country from achieving. “We may come from tiny islands, but the world knows who we are. We can’t help but be great. We are unique in our sound, our style, they way we move, the way we tell our stories. The video encourages people in TT to find their purpose in life. Reply to "We tend to discard our icons and heroes"